Thankfully, things are starting to get into the groove this week. Driving from NY to FL can throw a wrench into anyone’s workout routines I suppose—even if you are super organized! Not saying that I am overly organized, but this kind of threw fuel on the fire of competition preparation. lol So as I stumble over and across half opened boxes and make my way through the mayhem, I absolutely DO find my iPad and make sure to add up my macros. It will take nothing less than staying right on, as the weeks are seemingly flying by as we move into next year’s competition season. It is inevitable that some time was lost, but I refuse to look behind. My sights are looking straight ahead, and I am ready to push forward. I guess that card alone set a fire under me! Reason being is that in the deepest part of myself, I know what sacrifices were necessary to compete on this level and to be a part of the IFBB. Once only a dream that actually came true. A dream I never take for granted, and I find it hard to find the words to express my gratitude for my health, the inner strength, newly forming physical strength, those of you who have always supported me and especially J.M. Manion and the IFBB for giving me the opportunity to do what I love to do. As I mentioned last week, I have sent in a request for an invite to compete at the 2014 Ms. Figure International. Keeping my fingers crossed and will keep you posted. I am trying a new training protocol called HIT, a sort of a Mike Mentzer style of training. I took a few videos of myself performing some of the exercises (certainly not all), so you get a glimpse of the amount of weight used, the sheer number of reps, the extremely controlled speed of movement and the sheer mental strength required to complete even one exercise. It hurt deeply—physically, soulfully. And that’s what I want to feel everyday for the next 10 weeks. Because I know my heart, I know God lives in it, and he didn’t bring me through all of this to fall. Through God, all things are possible. And that is how I have the strength to write these words, to get up and try new exercise routines and to get up try again. And let’s say I am not able to train as specifically as I need to in order to ensure proper balance—no time is wasted when you are pushing heavy weight and when you need more muscle and now! So even if I switch back to more traditional volume training methods, there will be no regret with this intense jumpstart for 2014! Over the course of the long distance move I have dropped some weight. Previous Weight: Not sure if it was posted on these blogs, as it does change a bit. That said, I was weighing 144-147, even up to 149. I plan on doing my normal 2 HIIT-style cardio sessions, 2 full body conditioning sessions (another NEW adventure) and pretty much give all I have got internally to step it up over the next 2 weeks to really stimulate muscle fiber growth. I am going to try HIT training for a bit longer mainly because I have never done this kind of intensity before. I am a huge advocate of changing some aspect of training. For instance, I would never say train super heavy or intense all year long as that would be counterproductive. But, I have always mentioned to past and present clients that shocking the body is a superior way to make rapid changes. I had my first session the other day, and it was the most challenging style of workout I have ever done. I may stick with a double leg session a week with a trainer and do more traditional exercises, but as for now, I need all-over strength. So, the full body approach is working for these few weeks. I know, without question, that I moved more volume and total weight using HIT’s slower range of motion than I ever have before. I am talking about mind-blowing amounts of added weight (for myself anyway) and pyramid style drop sets that go up in weight initially and back down. I knew after the first exercise that every muscle fiber would be called upon, because of the one continuous set with more weight changes than I could even count. I was focusing on my part, which was the primary movement (e.g., retraction of shoulder blades) then the second movement (e.g. 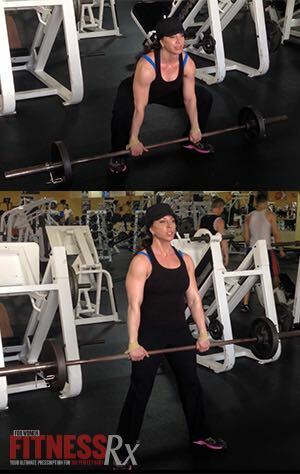 pulling back with use of back muscles, not just arms) and so on. So essentially, it was a whole new cup of tea. My objective was to remain as focused as possible to maximize the results as they were explained to me. Shortly, I will know if this will be a style I want to continue with or not, but it can’t hurt to try. Either way, I did take a risk and “broke some rules” in order to become the best Ava Cowan I can be. So, I am willing to try again and again. Switching something up in your current routine (duration, frequency, intensity, etc.) can be an effective way to illicit change, because you have not adapted to doing it over and over while receiving diminishing returns. I’m going to try HIT for a few weeks, plus posing and all of my other protocols, and should make a final decision as to how I will proceed over the next 10 days. Either way, I am ready to do this. I will say what fascinated me the most without question was the sheer amount of weight used (like weight I could never imagine moving in this lifetime!). After experiencing the endless reps and sheer volume of weight used, I immediately had the notion that this HIT training style would be the perfect “boost” for my training. And since I couldn’t see or hear too well…well heck, that was cool too! Another unique aspect is the super slow style of training quickly turns into a mental game to complete the workout, which lasts 30-40 minutes. Since my sights are set on the Arnold, I will give it a week or two and of course add in the kind of volume and conditioning routines I need to get me ready if I do get an invite. So I will factor everything in since the main objective is to build and maintain a balanced physique. I am hitting my nutritional goals and pushing my cardio to reach it. The second one is the one that sticks out to me today. 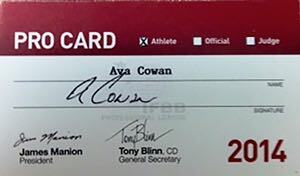 Ava Cowan is an IFBB Figure Professional, a CPTS® and full time online coach and consultant for women of all fitness levels. Become a part of "Team Ava": Customized Coaching and Consulting for all levels. Have questions, comments or just want to give me a shout? Discounts for new sign ups to Ava's Newsletter.